Classical music is proving to withstand the tests of time, so you might be wondering how an app can help get you more in touch with this rich, inspiring art form. 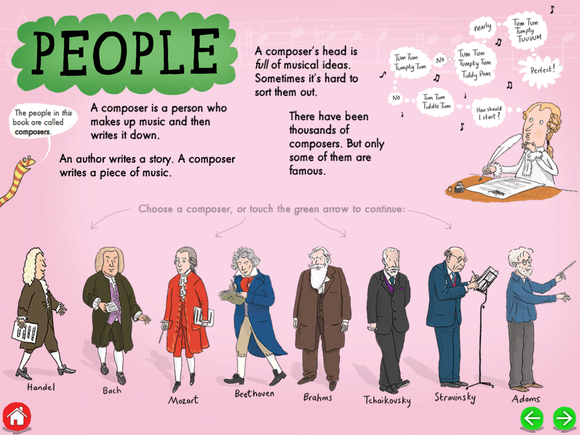 Sure, you may already consider yourself a classical music buff, but there’s always more you can learn about how orchestras work, or how certain classical works are constructed. Or perhaps you enjoy classical music and want to immerse yourself into the genre some more, but you don’t know where to start. Maybe you have kids, and you want to introduce them to classical music in a fun way. I looked at a number of apps—and some books—that can help you with any of those scenarios. Whether you’re a novice to the genre, or a seasoned musician, you’ll find something that will help you discover and learn more about great music. Let’s start young: If you want your kids to learn about classical music, you could always play music for them, but it would also be great for them to learn about music, instruments, and orchestras on their own. 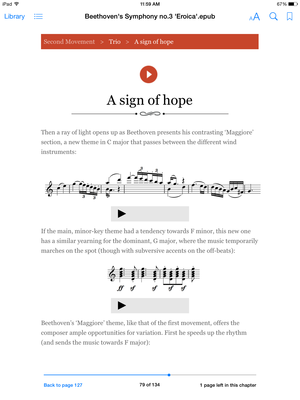 Naxos Records, a classical label, has released several apps designed for children. Their My First Classical Music App HD ($5) and My First Orchestra App HD ($5), both designed for age four and above, are fun ways for kids to learn more about music. My First Classical Music App introduces different types of music, instruments, and eight key composers from Handel to John Adams. With plenty of sound samples and simple text that kids can listen to by tapping if they can’t yet read, this is a friendly way to discover music. I’d like to see more information about how long each musical excerpt lasts; when you tap one, it plays, but there are no controls, and if you tap elsewhere, it stops, and you have to start over. But this is a friendly app with a cute design that will help kids realize that classical music isn’t threatening—or boring. This simple app introduces kids to classical music. In My First Orchestra App, kids can tap the different sections of the orchestra to learn more about each instrument and instrument family. 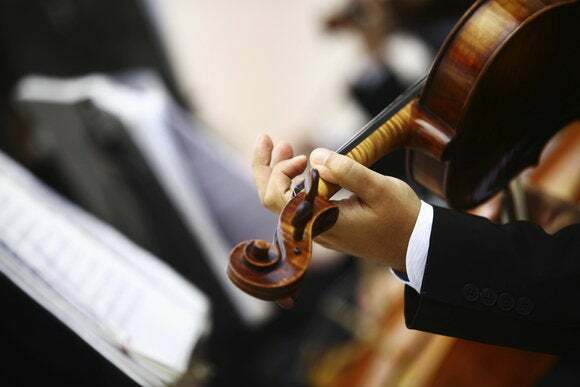 For each instrument, they can hear samples of classical works that use them, and learn a bit about how they’re played and their role in an orchestra. As above, they can tap text to hear it read, and tapping the musical excerpts displays a popup that shows the name of the work and its time. There are a number of quizzes—guess the instrument that you hear, for example—and a full list of the works included for those who want to go further. 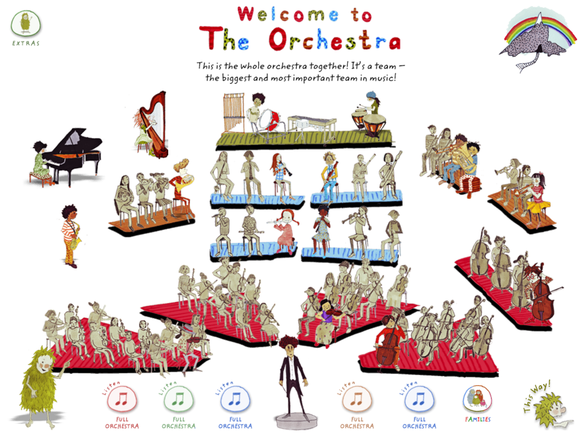 Children can learn about orchestras and their instruments in this app. For adults, there are some wonderful apps that will help listeners better understand their favorite classical works. Touch Press is a specialist in this area, with their app The Orchestra ($10) serving as a benchmark. In this app, you can discover excerpts from eight symphonies, learn how an orchestra works, watch an orchestra as it plays, follow along with a score, and read or listen to commentary from conductor Esa-Pekka Salonen. While you don’t need to be able to read music to appreciate this app, you’ll get a lot more out of it if you can. You can tap any of the videos in this app to zoom in on that view. Touch Press has several other apps that focus on specific works. The most impressive is Beethoven’s 9th Symphony ($14). (There’s also a free version that you can try out and upgrade with an in-app purchase.) 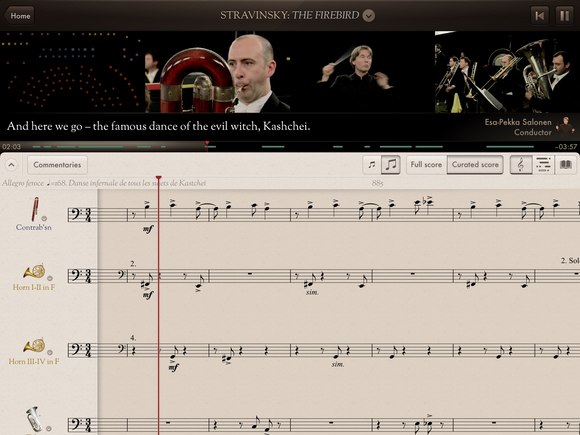 In this app, you go in-depth with what is considered to be the finest symphony ever written. You can compare four different full recordings from Deutsche Grammophon: Ferenc Fricsay, from 1958, Herbert von Karajan, from 1962, Leonard Bernstein, from 1979, and John Eliot Gardiner, from 1992. You can switch from one to another to appreciate the way each conductor performs the work, and the Bernstein version also has a full video of a performance. There is a wealth of information about the symphony in text, and in a dozen video interviews with performers and conductors. 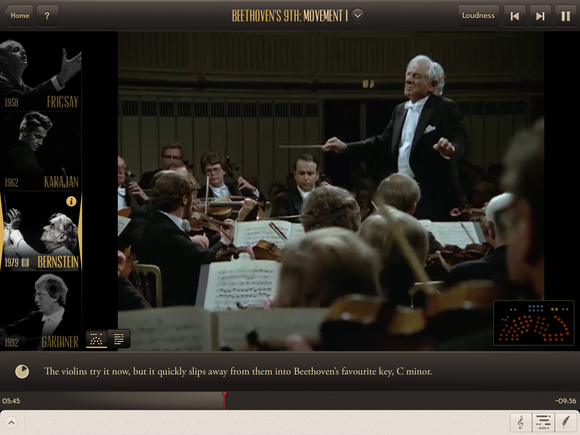 Discover Beethoven’s 9th symphony, and compare different recordings. Other Touch Press apps look at Liszt’s Piano Sonata and Vivaldi’s Four Seasons, and the developer is working on more apps that use the same approach. Learn more about Beethoven’s 3rd symphony in this enhanced book. Finally, there are some enhanced books that also examine great classical works. 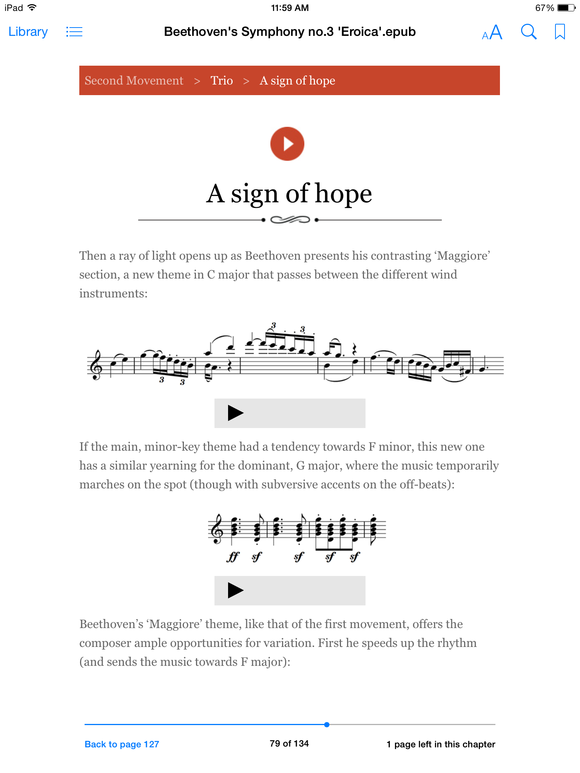 Erudition Digital’s Beethoven’s Symphony No. 3 “Eroica,” ($8) by Matthew Rye, looks at this work in detail: It shows excerpts from the score and discusses each section of the work with explanations and musical examples. The presentation is a bit dry, and these books are best for those who read music, but if you want to learn more about some great works, these books will help you. (There’s also a book about Bach’s Mass in B Minor, with other titles coming soon. So if you’re new to classical music, or want to learn more, or even get your kids interested in this music, check out some of these apps and books that are both informative and entertaining.